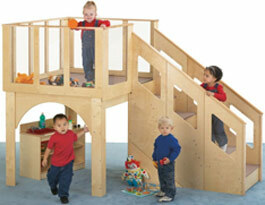 Create an indoor playground for a specific age group with one of these sturdily constructed lofts. Clear acrylic panels on decks allow unobstructed observation. Units include a lifetime factory warranty. Non-toxic, non-yellowing finish. ...More on the environmentally safe features of natural Baltic Birch school furniture.